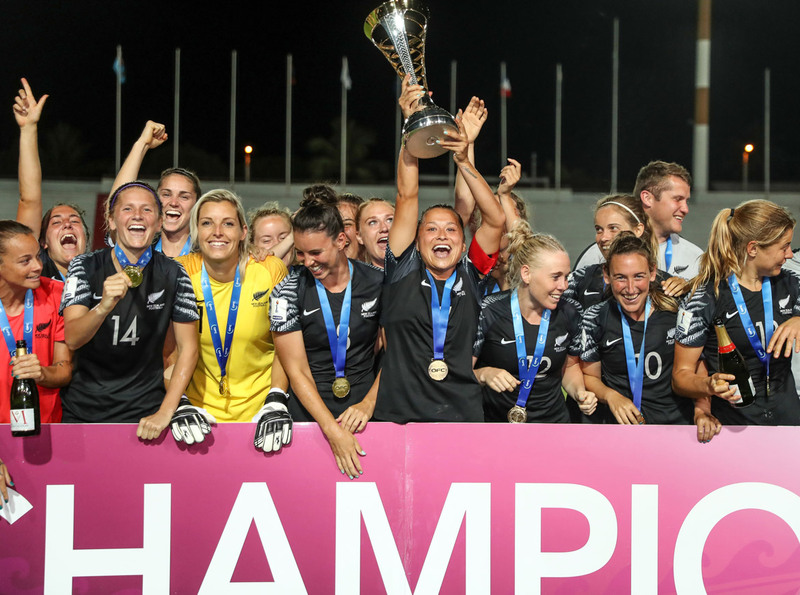 New Zealand have booked the 24thand final ticket to France 2019 with an 8-0 rout of Fiji in the OFC Women’s Nations Cup final, confirming their regional dominance with their fourth consecutive Oceania title. Despite holding up well for over 30 minutes, New Zealand were finally able to break down the defences once more when Hassett struck in the 38thminute before Meikayla Moore also added to the tally to give the Ferns a four-goal buffer coming back from the break. Fiji were left down a player for the second half after Cema Nasau received a second yellow card in the 40thminute following a challenge on Percival which earned her her marching orders. Once again New Zealand were much quicker off the mark following the restart with Ria Percival and Katie Rood finding the back of the net in the 46thand 48thminutes resprecively. “We can now reflect back on this game because it’s the kind of match where you can measure your status in the region. You play the best team in the region and you can see the difference. There’s a gap – a technical gap and the physical component as well. “That’s not to take anything away from the New Zealand team. I want to congratulate them for this victory and I wish them all the best in 2019 in France. In the play-off for third place it was Papua New Guinea taking on New Caledonia in a match for the bronze medal and the bragging rights of a podium finish. Going into the match both sides were motivated to do well and restore some pride after being knocked out of the semi-finals and it looked like it would be a close encounter despite Papua New Guinea running out to a 6-2 victory when they met during the group stage. On that occasion Marie Kaipu was the irritant for New Caledonia, this time it was Meagen Gunemba taking up the mantle in her teammates absence as she took just five minutes to outpace the backline and slot the opener past Dolores Bodeouarou. Clearly unhappy to have conceded so early on, New Caledonia worked hard to find an equaliser, controlling the midfield for long periods but struggling to find a connection between the middle and the attacking line. They managed to get off a couple of shots, Ami-Nata Ajapuhnya with the best of them, however Papua New Guinea goalkeeper Betty Sam was barely tested. It was a much tougher day on the pitch for her counterpart Bodeouarou who had to deal Gunemba and her striker partner Yvonne Gabong becoming constant threats with their darting runs in behind the defence. Gunemba had her brace by the 36thminute while Gabong added a third goal to the team’s tally just before the break. Selina Unamba was next on the board as PNG extended the lead to four before Gunemba had her hat-trick in the 54thminute. New Caledonia made a key change in the 59thminute as teenager Jackie Pahoa entered the field, taking just one minute to find the back of the net. However, that only motivated Papua New Guinea to do more as Gunemba struck in the 82ndfor her fourth of the afternoon before captain Sandra Birum made it seven. Winning coach Peter Gunemba was pleased his side were able to take something home from a tournament which proved more gruelling than usual for his side. “I’m proud of the girls. I told them we don’t have to go home empty handed, we win third place and that’s it,” he said. “I expected this performance should be in the semi-final but it didn’t happen so I was pleased to see them play this way today as that’s what I expect from them. Meanwhile for Kamali Fitialeata it was not the way he wanted to end the tournament but conceded Papua New Guinea was the better side on the day. “The match was tough, I thought the girls were ready for today but then I get the impression they were tired, worn out,” he said. In the competition’s individual awards it was New Zealand who took home the majority with the team picking up Fairplay, while Sarah Gregorius was joint-top scorer along with Papua New Guinea’s Meagen Gunemba. Consistent performances across the course of the competition led to New Zealand midfielder Betsy Hassett earning the Golden Ball while Fiji goalkeeper Adi Tuwai was awarded the Golden Gloves. New Zealand’s victory sees them join 23 other nations at next year’s FIFA Women’s World Cup in France. They also qualify to represent Oceania at the Olympic Women’s Football TOuranment in 2020.